While you’re holidaying on the French Riviera, Camping de La Pascalinette® recommends driving to the nearby Bouches-du-Rhône area to visit the “Calanques de Cassis” fjords. Located one hour from your favourite campsite on the highway (at the exit from Hyères), you will discover the charming little village of Cassis and Calanques National Park – an absolute must during your stay in the South of France. 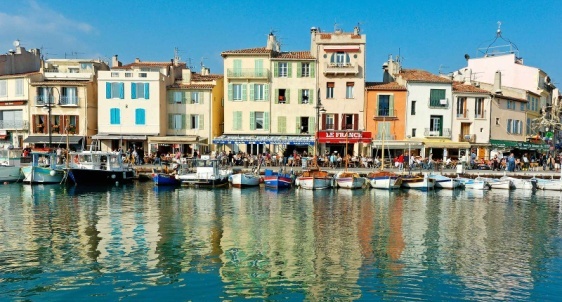 Cassis village centre is very pretty, with flower-lined streets and colourful houses. Stroll through the lanes to the little marina lined with restaurants, ice cream parlours and souvenir shops. From the port, you can opt for a boat tour of 3, 5, 8 or 9 fjords. The excursion lasts between 45 mins and 2 hours according to your choice. One thing is sure: the experience is unforgettable – turquoise waters, majestic limestone cliffs and exceptional flora and fauna. Simply stunning! There are several bars and cafés where you can enjoy a drink on your return to this typical little port. And to wind up your day in style, head to the campsite water park to relax in the jacuzzi or pools, or sit back and relax near the restaurant. You can also explore the Calanques National Park on foot.